Geek Girls Rule! #173 – Deadline by Mira Grant – Geek Girls Rule!!! I know, I’ve actually read a new book in a timely manner! Timely enough that the review might actually do some of you some good. Shocking, I know. But seriously, I want you all to consider the ramifications of this. I not only liked Feed (Newsflesh, Book 1) enough to get the sequel, but I liked it enough that I went and got the sequel the DAY AFTER it came out. It would have been the day of, but my bookstore has been having a little difficulty with their distributors. So I got it after work on June 1. Not only did I get the book on June 1, but I began reading Deadline immediately, and finished it, all 581 pages of it, by midnight on June 3rd. So, um, yeah. It’s good. As good as Feed (which has garnered a Hugo Nomination), possibly a little better. 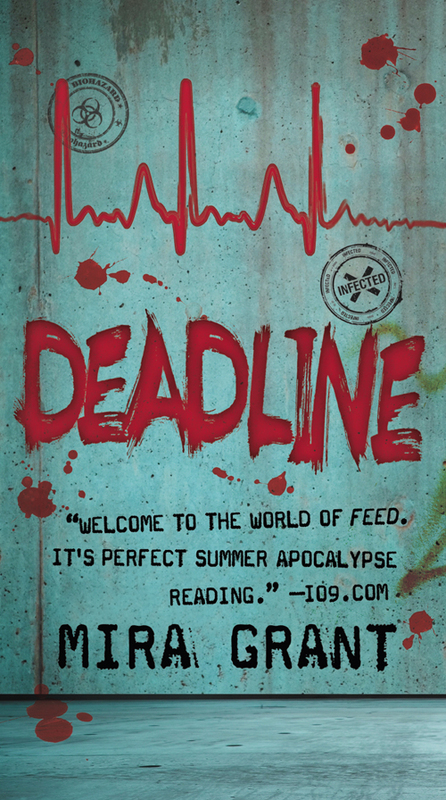 Deadline (Newsflesh, Book 2) follows the survivors of original After the End Times crew, as they push on in the aftermath of Feed. The good Senator is now President, and everyone is trying to go on living after the events at the end of Feed. I don’t want to give away too much about the end of Feed, because I know several of you haven’t read it yet, and I hate spoilers. What I will say is that the conspiracy our intrepid journalists uncovered in Feed is alive, well and gunning for them. If anything Deadline is paced even better than the first novel. I do most of my reading during my commute and I found myself seriously disgruntled when I’d reach either home or work, because it meant I couldn’t keep reading. As it was, I managed to make it about halfway through the book by the evening of June 2nd, and sat down to finish it on Friday June 3rd, after finishing up a podcast interview. The hits keep coming, the reader and the crew are equally off-balance for most of the book. There are reintroductions to several bit players from the last book, and a new crew of weirdos and outcasts aiding and abetting the After the End Times crew in their search for the truth. As before, the dialogue is stunning in its realism, and flow. The actions of the characters make sense in the context of their world and what has happened in it. Never once did I find myself yelling at the book because someone did something stupidly out of character. I couldn’t put it down until I finished it, and then re-read the last chapter several times to make sure I understood what had happened. If there are any plotholes, you enjoy the ride so much you don’t care. I cannot stress this enough, if you like fast-paced, gripping psychological fiction with a horror bent, do yourself a favor and pick up these books. Right now, after reading the ending, I’m unsure whether I want to punch Ms. Grant/McGuire or kiss her or shake her hand. And I’m a little put out that I’m probably going to have to wait for about a year to read the next installment. I haven’t been this excited about a horror series in years. I picked it up Thursday afternoon, and had finished it Friday night. Sometimes I wish I didn’t read so fast so I had more time to enjoy a good book. I LOVED the first one tons, and am so happy you pointed it out to me. It’s great to have for work, to be sure. Next Post Geek Girls Rule! #174 – A New Contest, Fund-Raising and the State of the Geek.